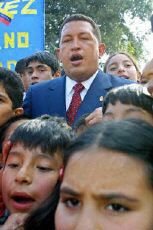 Venezuelan President Hugo Chavez sings the Peruvian national anthem on his arrival in Lima, where he celebrated the swearing-in of Alejandro Toledo. Chavez announced the reestablishment of diplomatic ties between Venezuela and Peru, ruptured because of the controversial capture of Vladimiro Montesinos in Caracas (Photo: AFP). The dramatic capture and extradition in late June of former Peruvian intelligence chief Vladimiro Montesinos—after an intensive international search uncovered his hiding place in Caracas—has provoked a major diplomatic flap and fueled heated political controversy in Venezuela over the role of President Hugo Chávez and his government in the Montesinos affair. Venezuelan security forces’ June 23 arrest of Montesinos, sought by Peruvian authorities to face multiple charges of corruption, bribery, and human-rights violations during his tenure as spymaster and political power broker under former President Alberto Fujimori, came just two days after Chávez’s widely reported assurance to Peruvian President-elect Alejandro Toledo that Montesinos “will be returned to your country sooner than a rooster can crow if he is in Venezuela,” the centrist El Nacional of Caracas (July 9) reported. In fact, the Chávez government’s description of the capture as an operation planned and executed exclusively by Venezuelan security forces conflicted with regional press reports detailing the FBI’s detention in Miami of a Venezuelan national attempting to withdraw large sums of cash from an offshore bank account linked to Montesinos. This Venezuelan provided information on the Peruvian fugitive’s whereabouts in Caracas that was subsequently conveyed to Peruvian authorities. Confusion over whether the Peruvian government communicated this information to Venezuelan authorities erupted into a diplomatic spat leading to recalls of the Venezuelan and Peruvian ambassadors. Danielle Parodi Manzano, writing in the centrist El Universal of Caracas (June 25), observed that “the government’s actions give grounds for the opposition to demand explanations from...Chávez about the stay in Venezuela...of Vladimiro Montesinos.” A subsequent El Universal report (July 9) noted that separate investigations have been launched by a committee of the pro-Chávez National Assembly and by an ad-hoc opposition committee. Venezuelan sociologist Edgardo Lander, in an interview with the leftist Página 12 of Buenos Aires (July 7), suggested that Chávez’s decision to recall the Venezuelan envoy from Lima appeared justified in view of evidence that the Peruvian government had authorized a police operation in Caracas without informing Venezuelan authorities.